Bill and Charles went to TimberWolf Lodge, our open camp in Rainbow Lake. Vern went to our rig camps in the Grande Prairie and Edson area. There are even pictures to prove it! Andy’s 10th Year Anniversary with Western! 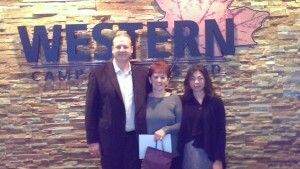 Congratulations Andy on your 10 year anniversary with Western! Thank you for your hard work, loyalty, dedication, your great attitude and smile!